Entering your own unique credentials, this will popup the standard windows login, let’s store our credentials to a variable called $cred, the benefits of doing this if we want to run multiple commands all under this account we can just recall our credentials without having to enter them every single time. In this example, after I retrieve my stored credentials I’ll check to see who is logged onto a computer named dev-ghost. I’ll be using gwmi cmdlet which is just an alias for the Get-WmiObject cmdlet. In this example, we are going to do the same as above, except we will specify the username, this is perfect for whenever you use service accounts. 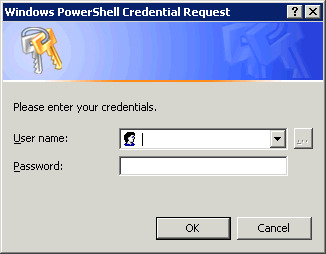 PS C:\>PS C:\> $cred = Get-Credential "dev-ghost\administrator"
Now let’s do the same as above, but instead of saving our credentials to a variable, we will just use it once and call it inline. PS C:\> gwmi win32_LoggedOnUser -computer "dev-ghost" -credential "dev-ghost\administrator"
Once you press enter just type in your password, this will save your password to a file called MyPassword.txt. So now that the password is saved as a "SecureString" we can now use these saved credentials. and that’s it, your all set to start impersonating your credentials so that you can run scripts or executable under your service accounts.